LOS ANGELES (Reuters) - Justin Timberlake snagged the No.1 Spot on the U.S. Billboard 200 album chart with "Man of the Woods," despite harsh reviews and a Super Bowl halftime show that was deemed underwhelming on social media and by music critics. "Man of the Woods," Timberlake's first studio album since 2013, sold more than 242,000 units in its first week of release, according to Nielsen Music data released on Monday. "Man of the Woods" marks Timberlake's fourth Billboard No.1 album and was the biggest-selling album in the U.S. since Taylor Swift's "Reputation" in December 2017, Billboard said. It debuted at No.1 after a Feb. 4 Super Bowl performance consisting mostly of Timberlake's old hits that also featured a controversial segment featuring a huge projection of Prince, who died in 2016. The former NSYNC singer also took heat on social media for failing to mention, or perform with, Janet Jackson after an infamous 2004 Super Bowl appearance which ended with Timberlake ripping off Jackson's top and accidentally briefly exposing her breast. Nevertheless, the Super Bowl and halftime show were watched by some 103 million Americans on television. 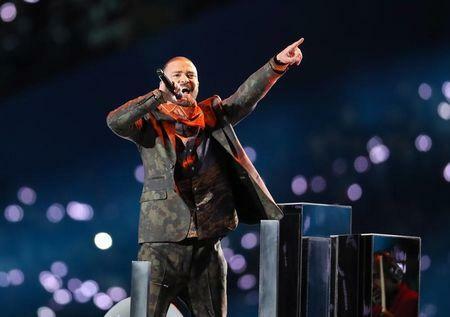 Nielsen Music reported last week that on-demand audio and video streams for all of the songs performed by Timberlake jumped 45 percent on the day after the game, compared to the day before. Timberlake, best known for pop tracks like "SexyBack" and "Rock Your Body," promoted "Man of the Woods" as a country-inspired album that took him back to his Memphis roots. But the album had few fans among music reviewers. Esquire called it "disappointing" and "kind of embarrassing," while USA Today said the album "can't pull off its Americana-pop fusion." On the digital Billboard songs chart, which measures online single sales, Timberlake had three songs in the top 20 - "Say Something" featuring Chris Stapleton, "Man of the Woods," and his 2016 hit "Can't Stop the Feeling." Canadian rapper Drake took the top spot with "God's Plan," with more than 55,00 units sold.